← Running Out of Room? The Basics. 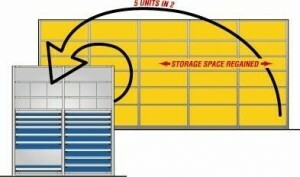 Are you storing an increasing number of small parts and getting squeezed for space? This post will focus on areas that use standard steel shelving to store parts, either in plastic bins, cardboard boxes or loose on the shelf and offer ideas to increase storage efficiency and save space. Usually, when you look at your shelving, you see a lot of ‘air’ above the parts and in half-filled bins or boxes. You may also see parts hidden behind other parts and areas of the shelving where it is hard to see exactly what is there. The left side of the image below shows: (1) Hidden areas that are hard to see, (2) Poor lighting at the back of shelves, (3) Shelves blocking full visibility of products, (4) Unused, wasted space between shelves. You can gain space and, at the same time, make it easier to find and identify your parts by using drawers in your existing shelving units. The right side of the image above shows: (1) Shelf spacing sized to fit your product more exactly, with roll-out shelves to access items on the bottom level, (2) Smaller shelf spacing at eye level for mid-sized products, (3) Drawer units that offer full visibility of all products, (4) Reduced wasted space between shelves. Converting your existing shelving into modular drawer storage units saves space and increases storage capacity. You will also have better access to smaller parts, better visibility, easier picking and faster inventory counts. This is accomplished using drawer adapter brackets, manufactured by Rousseau Metal. These brackets are available to fit most shelving brands and allow installation of a full line of heavy duty modular parts drawers and compartment accessories. The Rousseau modular drawers are available in true North American dimensions to match existing shelf sizes, from 18” and 24” deep and from 30” to 48” wide. There are 10 drawer heights available from 3” to 14” high with the usable inside height being 1” less than the face dimension. The adapter brackets to support the drawers are available from 12” high to 48” high and you can install any combination of drawer heights that will match the bracket height. In a typical application, you would install a 36” to 48″ high group of drawers in an existing shelving unit. This set of drawers can be customized to suit your products. The most common application will have a set 7 drawers with heights from 4” to 8” high. All the drawers have full extension, so the full depth of the drawer is visible when open. These 7 drawers can replace the space taken by up to 3 shelving units, 36″ w x 12″ deep, in most systems. So, by moving smaller parts into these drawers, you can recover several shelves worth of space in another unit. This creates the space to add another bank of drawers in the empty unit. Moving along this way, unit by unit, you can move inventory into more efficient drawer storage, leaving empty units left over at the end for new products. This entry was posted in Small Parts Storage. Bookmark the permalink. One Big Parts Room or Many Small Ones?